Oh yeah, baby. It’s happening! 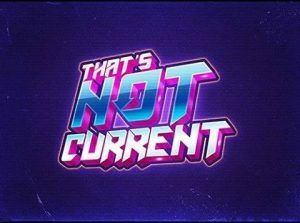 After months of gathering writers, artists and generally awesome people together, That’s Not Current is launching. I am so incredibly proud to be a part of this. I’ve gotten to make some amazing friends and colleagues out of my involvement. To my TNC family: I love you. All of you. Even if we differ in opinions. Each and every one of you is extraordinarily talented, from art work to musical taste to sheer cinema knowledge and writing ability. The things I’ve gotten to see and read… you guys make me smile. You make me feel like I’m part of something special, which is a feeling hard to come by in this wacky world we inhabit. I love you wonderful people madly, and I’m proud to stand by your side as we launch. To the ends of the Earth, comrades. There are many more writers; these are but a few. Again, so very honored to be working with them. We hope you like our show.